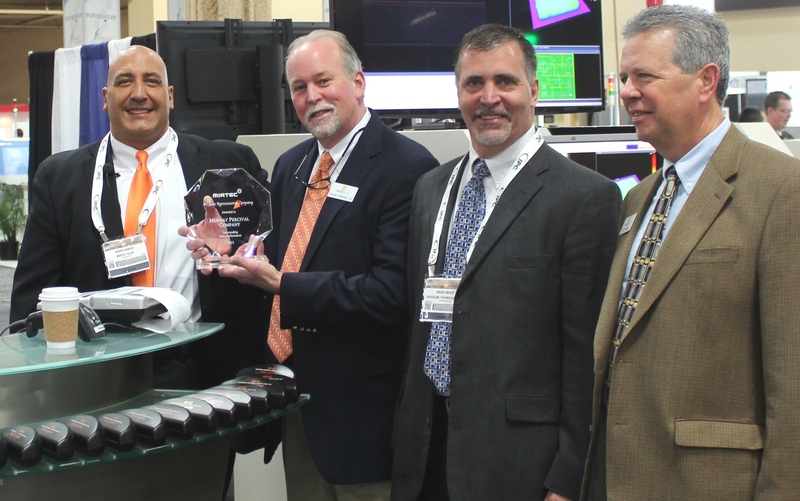 MIRTEC, “The Global Leader in Inspection Technology,” named us “MIRTEC Manufacturer’s Representative Organization of the Year 2013’ at this month’s IPC APEX. stated Brian D’Amico, President of MIRTEC Corp.
Today the company is managed by Murray’s three children, Murray Jr., Mark and Pam. And now representing a third generation are Murray III, Mark Jr and Matt. As a third-generation family-owned business, the company has evolved from hardware provider to Process Enabler, delivering to customers and utilizing ourselves the most modern tools and processes. “I have personally had the pleasure of working with this organization for nearly seven (7) years. Throughout this time, I have found their team to be extremely knowledgeable and professional. To their credit, the Murray Percival Company has sold nearly forty (40) MIRTEC machines in their respective territory. In recognition of their outstanding effort, it gives me great pleasure to present them with MIRTEC’s 2013 “Manufacturer’s Representative of the Year” Award.” stated Brian D’Amico, President of MIRTEC Corp.